We started the production in 1984 with a lot of zeal and ambition.The beginning was very hard, but we ucceeded in overcoming all the difficulties.. Today here are 6 employees in two shifts. 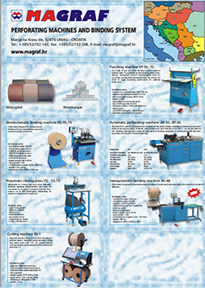 The choice of high quality material and machines for production. High quality products under acceptable prices. - optimal relation between quality and price. Standard wire spiral production in 6 colours- white, red, blue, green and silver. Our business politics and the constant follow up on what is going on the world market enabled us to expand in export also outside the national borders making the net of satisfied customers.